The view of space shuttle Endeavour's last launch from the press site at NASA's Kennedy Space Center on May 16, 2011. CAPE CANAVERAL, Fla. — It still hasn't sunk in that space shuttle Endeavour will never launch again. As I watched the orbiter streak through the sky on its final voyage, I tried to contemplate the event's significance but was mostly startled, as I always am during a shuttle launch, by my senses. 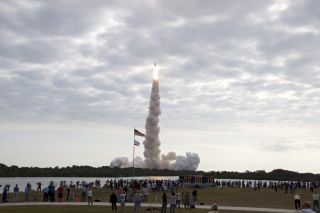 Endeavour blasted off on its last mission Monday (May 16) at 8:56 a.m. EDT (1256 GMT). The orbiter will spend 16 days in space, delivering an experiment to the International Space Station that scientists hope will unlock secrets of the universe such as dark matter and antimatter. The flight is significant, not just because of what it will accomplish, but because it's the end of the line for Endeavour. After the shuttle completes this 25th mission of its career, its next flight will be on the back of a Boeing 747, on the way to its retirement home at the California Science Center in Los Angeles. NASA is mothballing its three space shuttles to make room for the next phase in American spaceflight: an eventual trip to an asteroid and Mars. SPACE.com reporter Clara Moskowitz stands in front of the space shuttle Endeavour at Launch Pad 39A at Kennedy Space Center on the day before its final launch. On Monday, the atmosphere here at the Kennedy Space Center's press site was a mix of excitement, nerves, and uncertainty in the hours leading up to launch. As with any launch, everyone wondered if it would actually happen that day. We'd endured a first launch attempt on April 29 that was called off because of a technical glitch on the shuttle. This time, the countdown was proceeding smoothly, but the weather is always a big "if" right up until liftoff. Forecasts had predicted a 70 percent chance of good weather, though there was a possibility of clouds or strong winds preventing a launch. In the end, the clouds thinned out and the winds stayed down, inviting Endeavour up into the sky. Just before the countdown came out of a planned hold at T minus 9 minutes, flight director Mike Leinbach conducted a final "Go/No Go" poll among his team to ask if all systems were ready to launch. When everyone said, "Go," including the shuttle weather officer, I started to realize that the liftoff was really going to happen. It might also be one of the last liftoffs of a U.S.-built manned spacecraft in quite a long time, considering the replacement for the space shuttle is not yet built, or even decided on. But all of that was hard to process when I was watching a giant firecracker zoom off of Earth. It was barely possible to reconcile the sight with the fact that there were people on board. The space shuttle is so incredible; if I didn't know it was possible, I'd never believe in it. And I'm one of the lucky few to have witnessed the vehicle in action. How, I wonder, will future generations ever understand the majesty and magic of what this machine could do?